How to configure the module mod_jk with Apache and Jonas ? 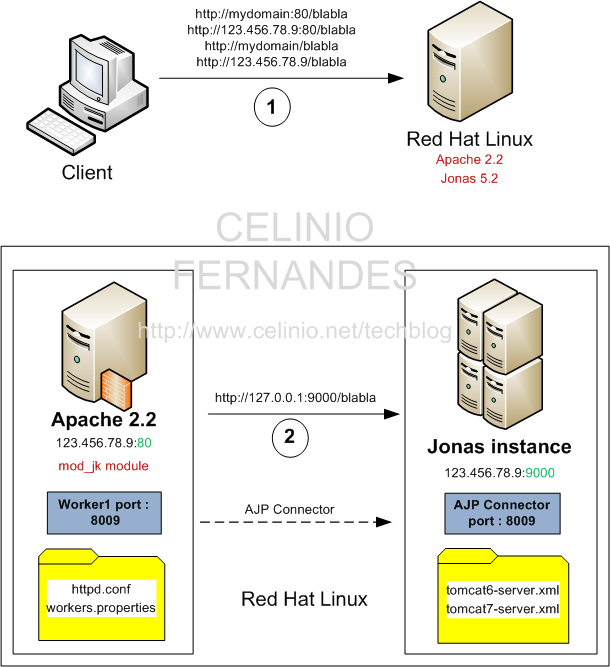 Apache is often the web server used in front of an application server (for instance Jonas). mod_jk is an Apache module which can be used to forward a client HTTP request to an internal application server, using the Apache JServ Protocol (AJP). First, you need to load the mod_jk module into Apache when it starts. JkRequestLogFormat "%w %m %V %T"
The line JKMountCopy All is very important. It copies the mount point definitions in all the virtual hosts. Here I have created only one worker (worker1) because I just want to forward requests to an instance of Jonas. There is no load-balancing in this configuration since there is only one single instance. loadbalancer is not a real worker, it is responsible for the management of several “real” workers.